This post is brought to you by CLIF Kid. All opinions are our own. I grew up on a mountain, in a development nestled deep in the woods of the Poconos. Living in the woods, I spent an incredible amount of time outside. I climbed trees. I fell out of trees! I splashed through streams and puddles, brought home handfuls of salamanders after a rain storm and had wild adventures every day. I even made friends with a bobcat, although that freaked my grandmother out something fierce when she found out! What can I say? I was a bit of a wild child, and the wild creatures loved me! Fast-forward a quarter of a century to the first time my son climbed a tree. I almost keeled over! “Get down! You’ll fall! You’ll break your head! Danger, Jacob, Danger! !” The tree in question was barely taller than me! What on earth was wrong with me? Could it be that parenting tamed the wild child right out of me? Worse, was I going to tame it right out of my son before he even had a chance to experience it for himself? The moment we become responsible for an itty-bitty life, something changes inside of us. We suddenly see dangers that we never saw before. Some of those dangers are real. Playing in traffic? Never a good idea. Petting a wild bobcat? Probably not a great idea either. Climbing a relatively low tree? Splashing in a puddle? Getting muddy? Not really all that dangerous. 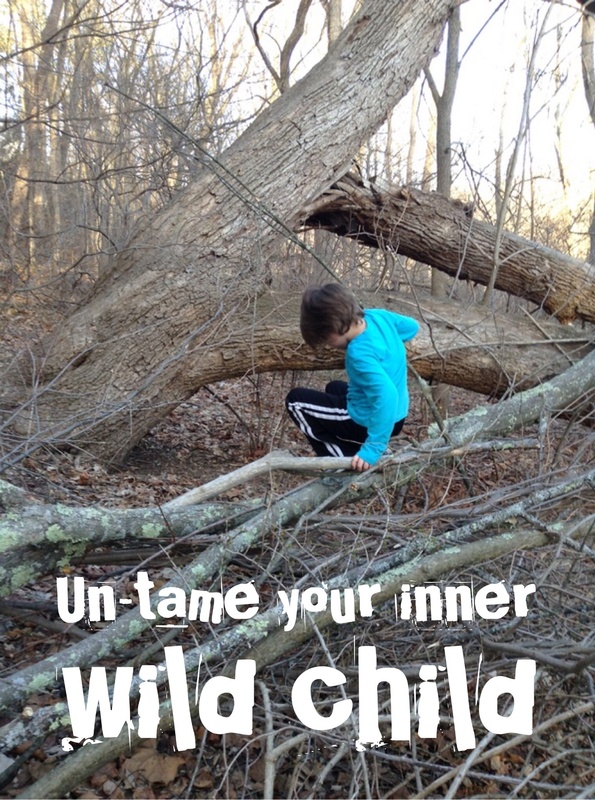 I say it’s time to un-tame our inner wild child and let our kids get back to being kids! Let’s reclaim the magic and excitement of outdoor play. Since I know that’s more easily said than done, here are some affirmations to say to yourself every time you want to hold your child back from exploring. There are no sharks in puddles. A puddle is just a small gathering of water. It’s not an ocean. It’s not a lake. It’s not even a kiddie pool. The chances of drowning are incredibly slim, especially if you are watching. They will NOT catch pneumonia from having wet feet. Jumping in a puddle will get their clothes wet. That’s about it. Yet they’ll have so much fun doing it! Mud washes, memories last. 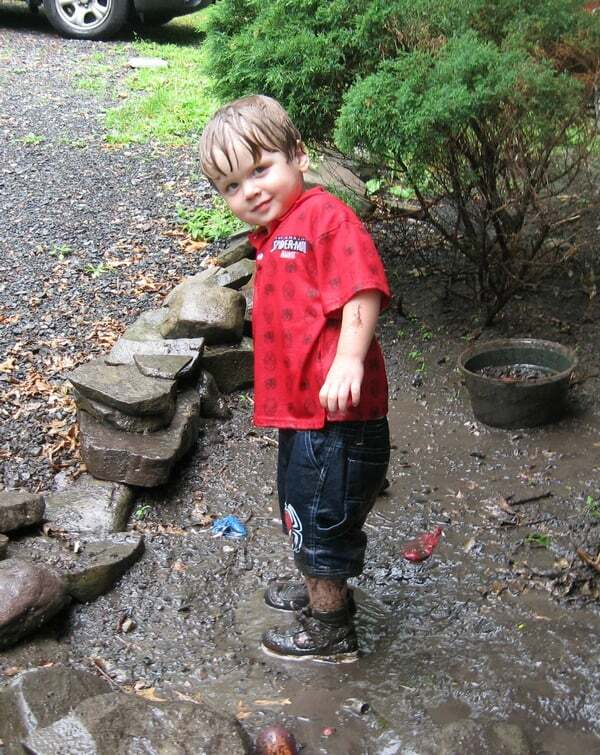 My all-time favorite picture of my son is one of him splashing away in the mud. A friend said “wow, I can’t believe you let him do that, aren’t you worried about him getting those clothes dirty?” With 10,000 stain removers on the market, getting mud out of clothes isn’t an issue. The memories, however, never fade. Bones heal, scars fade. No one wants their child to break a bone. I freak out about this constantly. The other day, I told my mom “I am always so worried that the school will call and say that Jake broke a bone on the playground.” Her response: “so, then he breaks a bone.” It doesn’t faze her. My brother broke like three during his childhood. He grew up to be a perfectly healthy, successful lawyer. Do your best to keep it from happening, but don’t live in fear of it. We have excellent orthopedic doctors these days. They’re not going to starve. This one is for worriers like my mom! She tells me to let Jake be wild, climb trees and break bones, yet she freaks out if he eats dinner late. Go figure. Letting your kids play until the sun goes down once in a while isn’t going to completely ruin their good nutrition habits for life. Give them healthy snacks-like CLIF Kid Zbars, packed with a nutritious blend of complex carbs, fiber, and protein- to keep them going until they come in from their adventures. CLIF Kid has plenty of nutritious options with no artificial flavors, no high fructose corn syrup and no weird synthetic preservatives. Pack an “adventure bag” for your kids and set them free! Childhood is fleeting. My son was born. I blinked. Now he’s turning 10 this year. It’s over before you know it. Do you really want to let it pass by without ever seeing your child’s face as he stomps in the mud? Hear his victory cry as he tackles that tree in the backyard? Watch him swing on a rope swing or build a teepee out of giant sticks? The outdoors offer endless opportunities for amazing memories. Don’t let fear hold you back from making them. The great outdoors holds so many treasures for kids and parents. Fresh air isn’t just good for your body, it’s great for your mind and spirit too! Some of the best memories are made outside. No one looks back on their childhood and says “wow, that day I spent playing Tetris was amazing!” I can’t tell you a single one of my highest scores on any of the video games I loved, but I can tell you that the highest tree I ever climbed was as tall as the second floor window of my house! For the sake of your child’s future memories, un-tame your own inner wild child and reclaim the magic of playing outside. Trust me, it’s totally worth it! How do you get over your fears and let your kids be more adventurous outdoors? Tell us in the comments! Give Kids a Special Treat with Our Love Bug Punch Valentine’s Day Drink Recipe! I totally agree! My son loves to get messy. We are all about outside and paint and running around! I remember when I went to pick up the kids, when the older two were small like 1 and 2, at my mom’s house. She had let them get into a mud puddle and play. They were cover head to toe. It was so funny and they had had a blast. They have done it several times since and are 9 and 10 now. The baby won’t touch a mud puddle. She doesn’t like to get dirty. Your son is so cute whit all mud splashed around. I agree they need to enjoy and have fun, once you grow up you have so many rules and restrictions to follow. As long as no one gets hurt I am all in for the inner WILD! It’s so important for kids to get outside and explore. When I was akid I used to go for long nature walks wit my grandmother and I’ll never forget how much fun those were. My kids play outside all of the time. We don’t have wilderness nearby, but they venture out with each other all of the time. They love the freedom and learn a lot of skills, including looking out for each other. Times have really changed from when I was a kid. We could ride bikes all day long outside until the street lights came on, play in the rain and dig muddy holes in the yard to try to get to China. All those experiences are great for kids – definitely much better than watching TV or playing video games all day. I absolutely love your attitude about the mud. I’m a big fan of letting kids be kids too. I know our world has changed a lot since we were kids. Of course, I moved countries a couple of times as well, that doesn’t help. My kids don’t like to play outside much though, whether I am around and am watching them, or not. We have a wild backyard, and they only play in the front yard. I am not going to twist their arms either, as I am scared they would get hurt. Tough luck with the outdoor play. Maybe some day they will go on their own. Oh my little guy loves to be outside. I am not an outside person so it is definitely a sacrifice for me to give in to his playful desires. I do let him play in the dirt and bring in a few bruises from playing rough. More parents need to give their kiddos the gift of play! I really love the sentiment of this post. I grew up in what can be called the city but at a young age I always had a thirst for exploration. I remember getting on my bike and riding around in alleys in search of adventure. I found this back way to all of the apartment complexes in my neighborhood and made my cousin explore it with me as if we were in the jungle. I agree you have to let your inner wild child free! My kids loved to play outside when they were younger. It is such a great way for kids to use their imagination. I am guilty of not letting my kids play outside by themselves. I do let them stomp in puddles after it rains. I try to let them have fun when we are outside. We love the outdoors. My littlest one used to be the adventurous one but lately she seems to have lost her edge. I’m hoping to ease her fears soon! We’re definitely an outdoor family and we love exploring the woods as well. Kids these days are so caught up with electronics that they fail to enjoy MOther nature. I love outdoor adventures with my kids. We have a lot of fun with them and we make some great memories. We love the outdoors! Its always nice to allow the kids to run free and expand their imagination. I grew up out in the country playing in the mud and rain. i have pass those traditions down to my children. Encouraging outdoor play is a great thing. It’s always nice to utilize your local parks and nature centers for fun and learning. Outdoor play is a lot of fun! I totally encourage this idea, can’t have them stored inside all day, we need to get back to the old way of play. I think that the art of playing outdoors is lost on kids today, for sure. It seems as though it is either video games or TV for the kids of today, and that is not healthy. You are right to bring back the outdoor play! One thing I pride myself on is having the ability to get dirty & playful with my child. We have always spent time outdoors & indoors experiencing all types of childhood adventures. Mud washes, memories last. YES!!!!! My kids love getting outside and exploring. We have a ton of woods and creeks around, and they’re always off exploring. 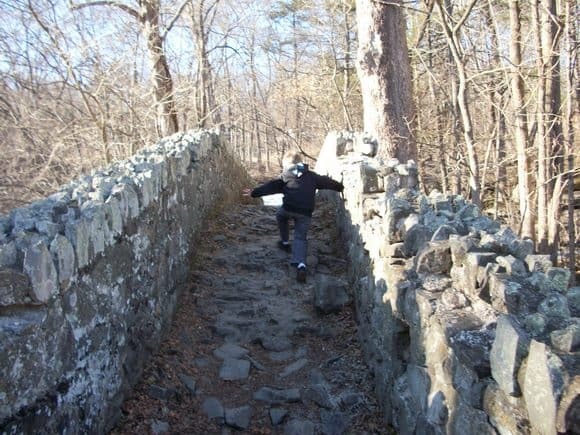 My son has always been adventurous! Now he is 17 and yesterday he and his friends drove over an hour away to go to Lake Erie to fish. It made me nervous, but he is almost an adult and needs to learn to be independent. I need to learn to trust! I can’t wait to get messy, jump in puddles etc with my new grandkids! I was too careful with my own kids.